Don’t I look like the perfect housewife? Pearls and a martini: what better accessories can one possibly have? You can Mad Men Yourself too. How excited was I when I got home today and found my Mad Men calendars waiting for me on the dining room table?! I’m so looking forward to spending the months of 2009 surrounded by vicarious pearls, heels, and pencil skirts. Unfortunately the calendar (designed by Dyna Moe) is sold out at Zazzle, but she still has some pretty fab framable pieces on sale. Ever wonder “What Would Joan Holloway Do?” Well now you can make her do whatever you want. 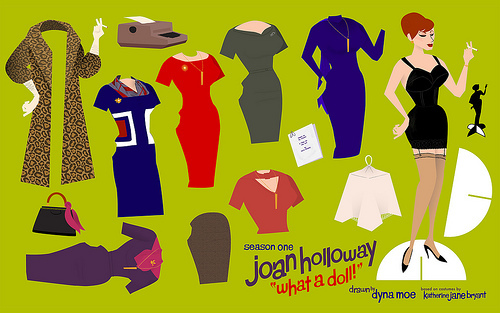 The awesome illustrator behind all of those fabulous Mad Men wallpapers just released a Joan Holloway paper doll. Personally I’d like her to whip up a pitcher of martinis and teach me how to recreate her fabulous up-do. By the way, if you’re looking for a gift to fill my new pink Christmas stocking this will do just fine.